Carole Jo’s parents, Jacqueline and Myron Milgrom, nurtured her life long passion for music. They supported Carole from the minute she sat down at the piano at age seven where Carole discovered that she could play by ear. It went without saying that every Milgrom family reunion would conclude with Carole at the piano. 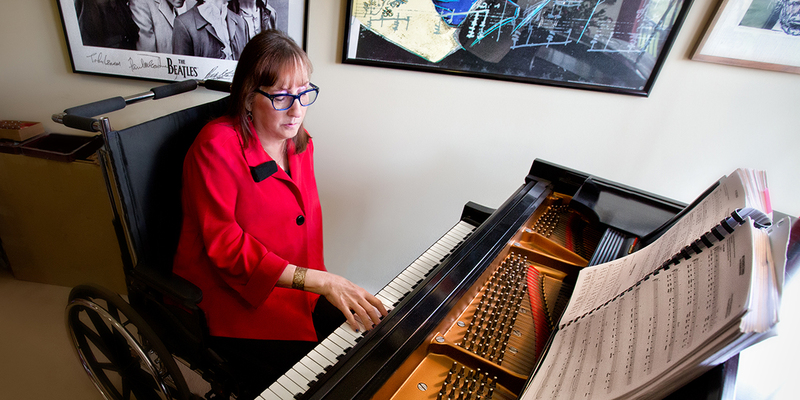 Earning her bachelor’s degree in music at Michigan and an advanced degree in music pedgagogy at Schoolcraft College, Carole found her calling first as a much sought-after piano teacher and later as a performer- both major aspects of her life. We took care of Carole Jo Lasser, z’l, in both palliative and hospice care, and after her death in June 2016, Jacqueline and Myron decided to set up a fund to make certain other clients could enjoy music the same way Carole did. Currently, two musicians visit our patients: Hazzan Daniel Gross of Adat Shalom plays the keyboard/piano, and Lisa Soble Seigmann, of Jewish Federation plays the guitar.